Cambridge University Press. As New. 1983. Paperback. 0521096626 . *** FREE UPGRADE to Courier/Priority Shipping Upon Request *** - *** IN STOCK AND IMMEDIATELY AVAILABLE FOR SHIPMENT - AS NEW, THE TEXT BLOCK IS PRISTINE, CLEAN, UNMARKED, AND IN EXCELLENT CONDITION - -- - Corresponds to ISBN: 0521096626. 205 pages. Description: "An account of the development of Greek art in the Classical period (about 480-320 BC) which places particular emphasis on the meaning and content of Greek sculpture, architecture and painting. Professor Pollitt reminds us that the visual arts in Greece, as elsewhere, were primarily vehicles of expression. He does not ignore formal development but always relates this to social and cultural history, which it reflected and from which it grew. While his subject is art, he refers frequently to the literature and philosophy of the period which were shaped by the same influences." -- with a bonus offer . Cambridge University Press. As New. 1972. Hardcover. 0521080657 . *** FREE UPGRADE to Courier/Priority Shipping Upon Request *** - *** IN STOCK AND IMMEDIATELY AVAILABLE FOR SHIPMENT - AS NEW, THE TEXT BLOCK IS PRISTINE, CLEAN, UNMARKED, AND IN EXCELLENT CONDITION - -- - Corresponds to ISBN: 0521096626. 205 pages. Description: "An account of the development of Greek art in the Classical period (about 480-320 BC) which places particular emphasis on the meaning and content of Greek sculpture, architecture and painting. Professor Pollitt reminds us that the visual arts in Greece, as elsewhere, were primarily vehicles of expression. He does not ignore formal development but always relates this to social and cultural history, which it reflected and from which it grew. While his subject is art, he refers frequently to the literature and philosophy of the period which were shaped by the same influences." -- with a bonus offer . 1972-08-08. New. Ships with Tracking Number! INTERNATIONAL WORLDWIDE Shipping available. Buy with confidence, excellent customer service! 1972-03-07. Good. Ships with Tracking Number! INTERNATIONAL WORLDWIDE Shipping available. May not contain Access Codes or Supplements. May be ex-library. Shipping & Handling by region. Buy with confidence, excellent customer service! Cambridge University Press. Hardcover. 0521080657 New Condition. . New. Cambridge University Press. PAPERBACK. 0521096626 New Condition. . New. Cambridge University Press. PAPERBACK. 0521096626 Special order direct from the distributor . New. 1972-08-08. Good. Ships with Tracking Number! INTERNATIONAL WORLDWIDE Shipping available. May not contain Access Codes or Supplements. May be ex-library. Shipping & Handling by region. Buy with confidence, excellent customer service! Cambridge University Press. Hardcover. 0521080657 Like New Condition. . Fine. Cambridge University Press. PAPERBACK. 0521096626 Like New Condition. . Fine. Cambridge University Press, 1972-03-10. Paperback. Used:Good. Cambridge University Press, 1992. Soft cover. New. 8vo - over 7¾ - 9¾" tall. 152 x 102 mm. . An account of the development of Greek art in the Classical period (about 480-320 BC) which places particular emphasis on the meaning and content of Greek sculpture, architecture and painting. Professor Pollitt reminds us that the visual arts in Greece, as elsewhere, were primarily vehicles of expression. He does not ignore formal development but always relates this to social and cultural history, which it reflected and from which it grew. While his subject is art, he refers frequently to the literature and philosophy of the period which were shaped by the same influences. London: Cambridge at the University Press/Published by the Syndics of the Cambridge University Press, 1978. 1st Published: 1972 Reprinted: 1978. Soft Cover . Very Good. 8vo or 8° (Imperial Octavo): 8¼ x 11½" tall. Achilles-Penthesilea Kylix, Munich (Cover Design). 205 + xiv pp. A great, almost spotlessly clean copy! Solidly and tightly bound, essentially and nearly flawless copy with minimal internal and external wear and use. Copy with crisp pages, clean text, and light shelf wear. Smooth covers. Moderate browning, tanning, foxing or discoloration on cover pages. Over-sized and/or over weight book; may require additional postage. Please note that large and/or heavy items may incur extra shipping charge for both domestic and/or international shipments. Cambridge: Cambridge University Press, 1979 "An account of the development of Greek art in the Classical period (about 480-320 BC) which places particular emphasis on the meaning and content of Greek sculpture, architecture and painting. Professor Pollitt reminds us that the visual arts in Greece, as elsewhere, were primarily vehicles of expression. He does not ignore formal development but always relates this to social and cultural history, which it reflected and from which it grew. While his subject is art, he refers frequently to the literature and philosophy of the period which were shaped by the same influences." 205p. illus. bibliography. index.. Reprint.. Softcover. Fine. Cambridge University Press, 1972-03-10. Paperback. Good. 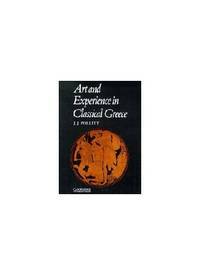 Cambridge: Cambridge University Press, 1979 "An account of the development of Greek art in the Classical period (about 480-320 BC) which places particular emphasis on the meaning and content of Greek sculpture, architecture and painting. Professor Pollitt reminds us that the visual arts in Greece, as elsewhere, were primarily vehicles of expression. He does not ignore formal development but always relates this to social and cultural history, which it reflected and from which it grew. While his subject is art, he refers frequently to the literature and philosophy of the period which were shaped by the same influences." 205p. illus. bibliography. index.. Reprint.. Softcover. Near Fine. Cambridge: Cambridge University Press, 1979 "An account of the development of Greek art in the Classical period (about 480-320 BC) which places particular emphasis on the meaning and content of Greek sculpture, architecture and painting. Professor Pollitt reminds us that the visual arts in Greece, as elsewhere, were primarily vehicles of expression. He does not ignore formal development but always relates this to social and cultural history, which it reflected and from which it grew. While his subject is art, he refers frequently to the literature and philosophy of the period which were shaped by the same influences." 205p. illus. bibliography. index. . Reprint. Softcover. Near Fine. West Nyack, New York, U.S.A.: Cambridge University Press. Soft cover. 0521096626 . Good. 1972. West Nyack, New York, U.S.A.: Cambridge Univ Pr, 1972. Paperback. Very Good/No Dj. Larger 8vo. pp. 205, b/w illustrations throughout, ""While the the subject is art, the author refers frequently to the literature and philosophy of the period which were shaped by the same influences."" Cambridge: Cambridge University Press, 1972. 208pp. Index, Biblio., Illus. Wear extremities, rubbing.. Paperback. VG-. Cambridge University Press. PAPERBACK. 0521096626 We ship daily + good service buy with confidence . Very Good. Cambridge University Press. Used - Very Good. Former Library book. Great condition for a used book! Minimal wear. Cambridge University Press. Used - Acceptable. Former Library book. Shows definite wear, and perhaps considerable marking on inside. Cambridge University Press. Used - Good. Former Library book. Shows some signs of wear, and may have some markings on the inside. Cambridge University Press. Used - Acceptable. Ships from Reno, NV. Shows definite wear, and perhaps considerable marking on inside. 100% Money Back Guarantee. Shipped to over one million happy customers. Your purchase benefits world literacy! Cambridge University Press. Used - Good. Ships from Reno, NV. Former Library book. Shows some signs of wear, and may have some markings on the inside. 100% Money Back Guarantee. Shipped to over one million happy customers. Your purchase benefits world literacy! Cambridge University Press, 1999. pp.208 with index. pp.78-89 has some sporactic lines highlighted in pink else clean tight copy. Soft Cover. Near Fine. 8vo - over 7¾" - 9¾" tall. Cambridge University Press, March 1972. Paper Back Paper Back. Good. Externally almost like new, but heavy highlighting throughout text. Cambridge University Press. Very Good+. 1972. Paperback. 0521096626 . A Good Read ships from Toronto and Niagara Falls, NY - customers outside of North America please allow two to three weeks for delivery. Light wave to text block. ; 9.60 X 7.30 X 0.50 inches; 205 pages . Cambridge University Press, 1972-03-10. Hardcover. Good. Cambridge University Press, March 1972. Trade . 3 PB standard 50%. Cambridge University Press. Fair. 1972. Paperback. 0521096626 . Cover wear; 9.60 X 7.30 X 0.50 inches; 205 pages . Cambridge University Press. Used - Good. Ships from Reno, NV. Shows some signs of wear, and may have some markings on the inside. 100% Money Back Guarantee. Shipped to over one million happy customers. Your purchase benefits world literacy! Cambridge University Press. Used - Very Good. Ships from Reno, NV. Great condition for a used book! Minimal wear. 100% Money Back Guarantee. Shipped to over one million happy customers. Your purchase benefits world literacy! 1976 oversize paperback 5th printing. Curling and denting on cover, light tanning and soil at edge, else fine . For NY state residents I am required to add 8.875% sales tax. Cambridge University Press. PAPERBACK. 0521096626 ALL ORDERS SHIP WITHIN 24 HOURS. Tracking is always included. ALL ORDERS SHIP WITHIN 24 HOURS. Tracking is always included. This book is in Good overall condition. This item purchased from a national charitable organization thanks to your purchases we can continue to support them. Buy with confidence over 30,000 happy customers. All shipping materials 100% recyclable. REUSE-RECYCLE-REBOOK Buy with confidence over 40,000 happy customers. All shipping materials 100% recyclable. REUSE-RECYCLE-REBOOK . Good. Cambridge University Press. Used - Good. Good condition. Writing inside. Slightly dampstained. Owner's name on front endpage. Cambridge University Press, March 1972. Trade . Good. Good Softcover. Moderate soiling and shelfwear to covers. Pages clean and tight in binding. Pictures available upon request. A locally owned, independent book shop since 1984. Cambridge University Press, 1972. Paperback. Acceptable. Disclaimer:A readable copy. All pages are intact, and the cover is intact. Pages can include considerable notes-in pen or highlighter-but the notes cannot obscure the text. At ThriftBooks, our motto is: Read More, Spend Less.Dust jacket quality is not guaranteed. Cambridge University Press, 1972. Paperback. Good. Disclaimer:A copy that has been read, but remains in clean condition. All pages are intact, and the cover is intact. The spine may show signs of wear. Pages can include limited notes and highlighting, and the copy can include previous owner inscriptions. At ThriftBooks, our motto is: Read More, Spend Less.Dust jacket quality is not guaranteed. Cambridge University Press, 1972. Paperback. Good. Disclaimer:A copy that has been read, but remains in clean condition. All pages are intact, and the cover is intact. The spine may show signs of wear. Pages can include limited notes and highlighting, and the copy can include previous owner inscriptions. An ex-library book and may have standard library stamps and/or stickers. At ThriftBooks, our motto is: Read More, Spend Less.Dust jacket quality is not guaranteed. Cambridge University Press. Used - Good. Ships from the UK. Shows some signs of wear, and may have some markings on the inside. 100% Money Back Guarantee. Your purchase also supports literacy charities.